We are always up for finding new ways express our creativity through wall decor. 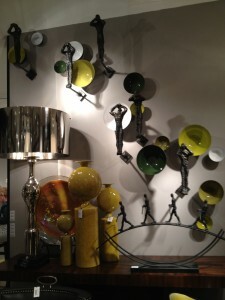 We love these bronze figures mounted on the wall paired with porcelain dishes in different shades of green. 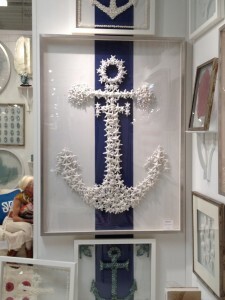 Summer is right around the corner and this unique piece of artwork is made from small pieces of cast resin starfish arranged in the shape of an anchor. It’s mounted in a plexiglass and the blue stripe is a removable piece of vinyl wall decor you can easily apply yourself. What a great way to transform a plain white wall in something fun. 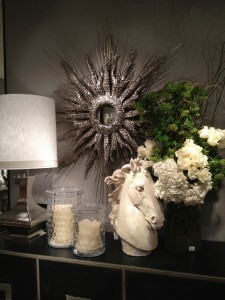 On trend at High Point Market this spring is the color combination of grey, green and white. Here’s a great mix of white porcelain against grey with a splash of white and green. We absolutely love this chair. The high back paired with the unique wood frame in a unique grey wash stain makes this very comfortable chair a great addition to one’s room decor. 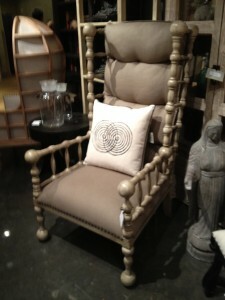 Imagine this chair against dark charcoal grey walls with mixed with vibrant reds and yellows. That wraps up our highlights from High Point this spring 2012. Be sure to check in as we will feature interesting DIY wall decor ideas, vintage inspired pieces and more. For information on any of the pieces you see in this post please contact us at Cheeky Living. 8 Favorite Must Have Looks for Interiors Cheeky Lust: Diane Von Furstenberg’s Home Tabletop Collection My Favorite Ceiling Fans Sweet Paul Mag’s Spring 2011 Kid’s Issue Is Out!